14th September 2004. Press conference. A group of artists presents the premiere of their show, “Xirgu”, in the Romea Theatre. 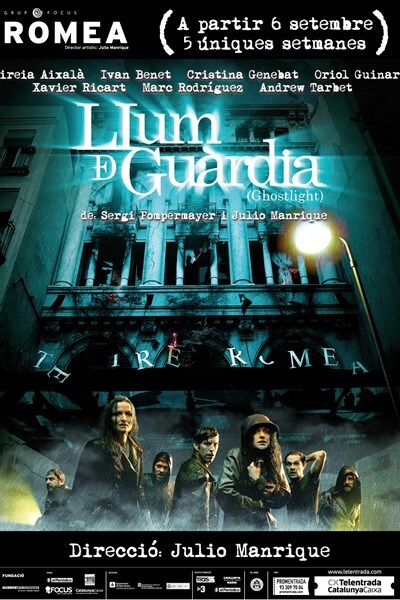 Clara, one of the group members, a deaf-mute actress and dancer, reveals something surprising: the legend that says Margarita Xirgu’s (the mythical Catalan actress) ghost walks around the Romea is true. She has seen it. And the ghost told her to cancel the show. Despite Clara’s warnings, the show premieres. The night of the premiere, the theatre burns down. “Romea’s fire” becomes part of the city’s black legend. 14th septiembre de 2011 (seven years later). The Romea is still closed, pending remodeling. The group that integrated “Xirgu” has fallen apart. Its members followed different paths, all of them away from stage. A strange curse seems to go after them after the fire. After seven years, Josh L. Franklyn, Xirgu’s former director, arrives in Barcelona, now a horror cult movies filmmaker. And this will change things. Strange and violent coincidences gather the group together again around the abandoned theatre.